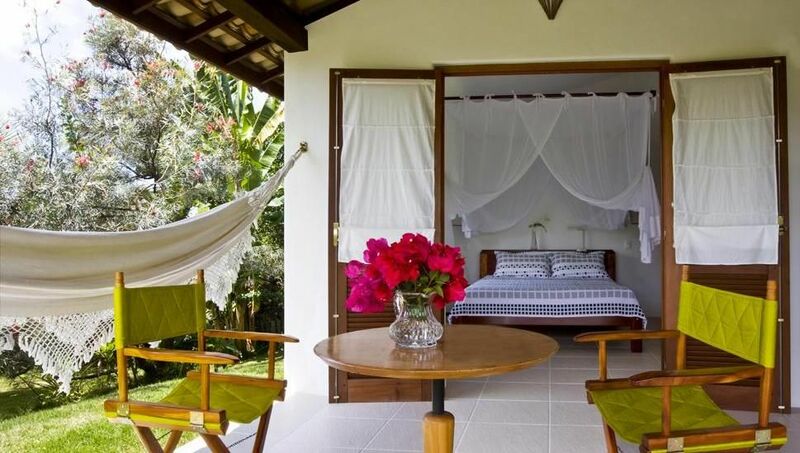 Two bedroom chalet with balcony located in a tropical garden at the entrance of the Trancoso Valley development. The property is in a quiet residential area. The cottage has two bedrooms, one with a queen bed and one with double bed, air conditioning, mosquito nets, fans and a balcony with table, chairs, hammock and sun loungers. The kitchen of the chalet is fully equipped. The bathroom is divided into 3 separate areas: shower, toilet and toilet. Outside the cottage is another shower. There is also a laundry area with washing facilities. We have Sky cable TV and Wi-Fi available. To the Square are about 10 minutes walking.